While the Qiandao lake in Zhejiang province, China may be beautiful, it covers an entire city that was submerged to create a hydroelectric power plant in 1959. Lion City, which was built more than 1,000 years ago, took it's name from the Five Lion Mountain beneath which it stood. Despite its rich history and impressive reputation, the city was flooded to create a reservoir that stretches for more than 573 square kilometers, and now serves as a popular tourist attraction. The city remains undisturbed from the surface at a depth of 26-40m, and has provided scientists and archaeologists a glimpse into what life in ancient China was really like. Many of the intricate stone carvings and guardian lions that were scattered around the city are still perfectly intact as seen in the pictures taken by Chinese National Geography. Qiu Feng, a local official in charge of tourism, first asked a Beijing-based diving club to come and explore the lake in 2001. Since then there has been an influx of tourists, and dive operators such as Big Blue in Shanghai organize trips to the city throughout the year, proving unusual opportunities to explore its underwater streets. A special submarine was also constructed to provide tours of the city, but has yet to be used due to local restrictions and concerns over damaging the city’s remains. While the submerged city might seem beautiful now, it’s important to remember that the Chinese government at the time were happy to bury Lion City, along with another large city, 27 towns, 1,377 villages, and almost 50,000 acres of farmland to create a hydroelectric plant. The move flooded thousands of homes and displaced 290,000 citizens – a large price to pay for electricity and entertainment for hapless tourists. The corrupt murderous Chinese government will steam roll over its historical buildings, it's poor students, steal from its poor farmers, and line their own pockets. This lake water is disgustingly filthy and full of poisons. The lake was built by the blood of theft and greed of the Chinese government. No one in China can voice an opinion contrary to that of the liars else they suffer. Re: Richard Wei, the Cultural Revolution wasn't the fault of stupid Communists. It was the fault if stupid teenagers who were allowed to riot and encouraged by the government to do so. Teens can be very stupid. Those stupid communist burn down and hammer down 80% of all these historic city buildings throughout china during the cultural revolution. All these cheap knockoffs / rebuilt buildings are no where near the original craftsmanship of ancient Chinese builders, which in their own right lasted a minimum of several hundred years before repair is needed. The city remains undisturbed from the surface at a depth of 26-40m, and has provided scientists and archaeologists a glimpse into what life in ancient China was really like. Qiu Feng, a local official in charge of tourism, first asked a Beijing-based diving club to come and explore the lake in 2001. 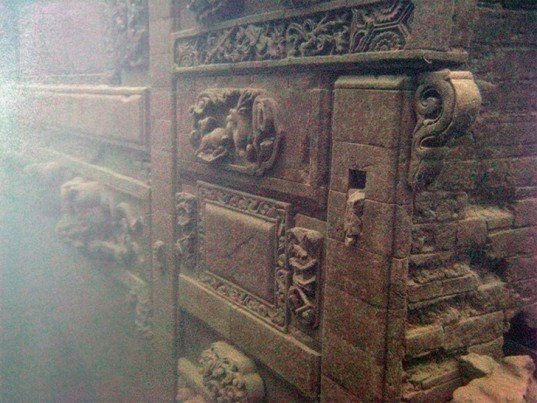 Many of the intricate stone carvings and guardian lions that were scattered around the city are still perfectly intact as seen in the pictures taken by Chinese National Geography. 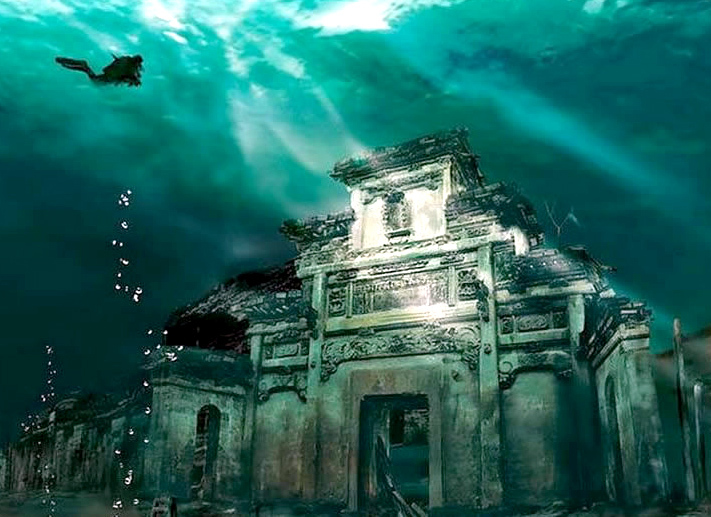 Since then there has been an influx of tourists, and dive operators such as Big Blue in Shanghai organize trips to the city throughout the year while also continuing to explore its underwater streets. A special submarine was constructed to provide tours of the city, but has yet to be used due to local restrictions and concerns over damaging the city's remains. While it might seem beautiful now, it's important to remember that the Chinese government at the time were happy to bury Lion city, along with another large city, 27 towns, 1,377 villages, and almost 50,000 acres of farmland to create a hydroelectric plant.